This week marks the anniversary of the Battle of Chancellorsville, and the mortal wounding of Confederate Lieutenant General Thomas J. "Stonewall" Jackson -- a very significant event during the Civil War. Indeed, historians have long debated the impact of Jackson's death on Confederate performance in subsequent battles such as Gettysburg. General Robert E. Lee, for one, felt the loss deeply, likening it to "losing my right arm." Jackson was mistakenly shot by his own troops when returning to camp as darkness fell on May 2. His left arm was shattered and field doctors amputated it. As the limb was about to be discarded, Jackson's military chaplain, Rev. Beverley Tucker Lacy, stepped in to save it. Lacy took the arm to his brother's nearby home, Ellwood manor, and gave it a full Christian burial in the family graveyard. A few days later, Jackson, who was weak from the operation, died of pneumonia. He was buried in Lexington, Virginia but his arm stayed interred at Ellwood to rest in peace per Mrs. Jackson’s request. That should have been the end of the story, but Stonewall’s arm would not get the peace it deserved. As noted in a Maryland colonel's journal, Union soldiers exhumed the arm in 1864. Although they apparently reburied it, no one knows if it was in the same spot or somewhere else. Years later -- in 1903 -- former Confederate soldier James Power Smith set a stone in the cemetery, marking the graveyard as the resting place of Stonewall Jackson's arm. If there was anyone who knew the true whereabouts of the arm in 1903 it would've been Smith -- he had served as Jackson's aide-de-camp during the war and had then married into the Lacy family. Still, some suspected that he may have intentionally mismarked the location of the arm to protect it from treasure-seekers. All we know for sure is that Stonewall’s left arm was once buried at Ellwood plantation cemetery and the event is recognized with a marker. The exact location of the grave -- and whether the arm is still there -- remain a mystery and source of curiosity. As John Hennessy, the chief historian at Fredericksburg and Spotsylvania National Military Park put it, Jackson's arm "was the most famous appendage in America at that time and certainly remains one of the most famous today." 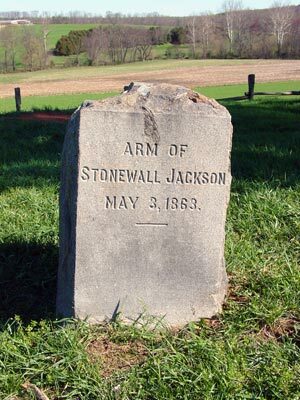 "The Trail and Tale of Stonewall Jackson's Arm," Mysteries and Conundrums blog by Fredricksburg and Spotsylvania National Military Park. Accessed May 1, 2013. Martinez, Ramona, "The Curious Fate Of Stonewall Jackson's Arm." NPR website. Accessed April 17, 2013. Mink, Erik J., "Visiting Stonewall Jackson's Left Arm at Chancellorsville." 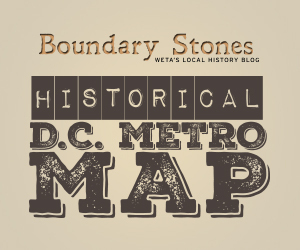 HistoryNet website. Accessed April 17, 2013. Repanshek, Kurt, "Where is Stonewall Jackson's Arm Buried?" National Parks Traveler website. Accessed May 1, 2013. On July 11, 1864 Confederate forces pushed toward Washington and President Lincoln found himself under fire.